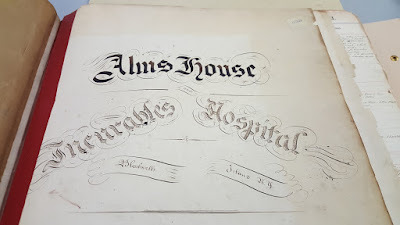 Then I started wondering about the location of the terrible-sounding Home for Incurables where Ella Wesner and her sister Mary spent their last days. 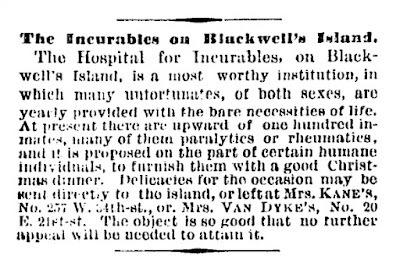 I ruled out the first Home for Incurables I came across, because it was founded in the Bronx. It became St. Barnabas Hospital, still in the Bronx today. The Faith Home for Incurables, at Park Place & Classon, though relatively close to Ella's Clinton Hill home, was also in the wrong borough. I then considered the Free Church Home for Incurables at 149 Second Avenue (9th Street), in today's East Village, but it closed in 1915, two years before Ella's death. 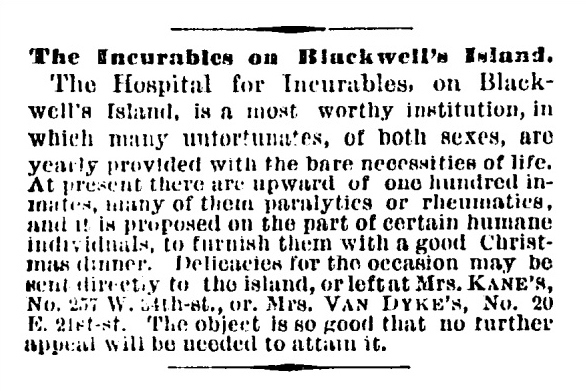 The only real possibility was the Hospital for Incurables on Blackwell's Island. The name was a little different, but it was the only hospital I could find within the boundaries of Manhattan that fit the date. If anyone can solve the mystery for sure, I'd love to know. 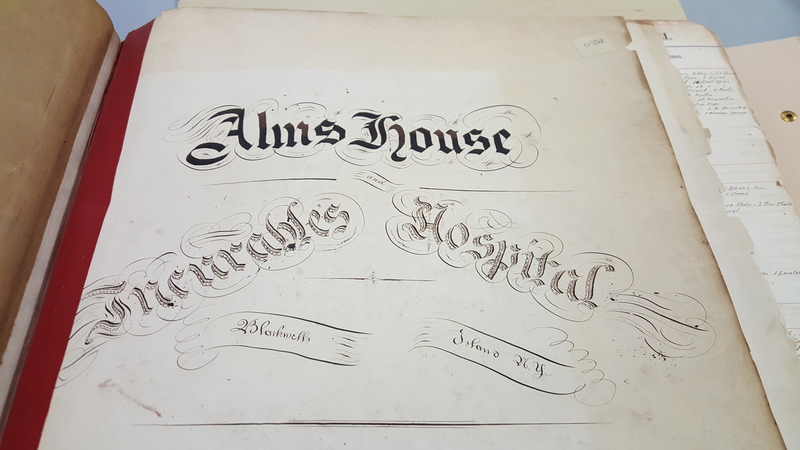 In addition to the Hospital for Incurables other nineteenth-century facilities on the island included a penitentiary, an almshouse, a workhouse, a charitable hospital and an asylum for the insane. What a grim place of exile for the city's unwanted. are afflicted with incurable diseases, but who require no medical attention. 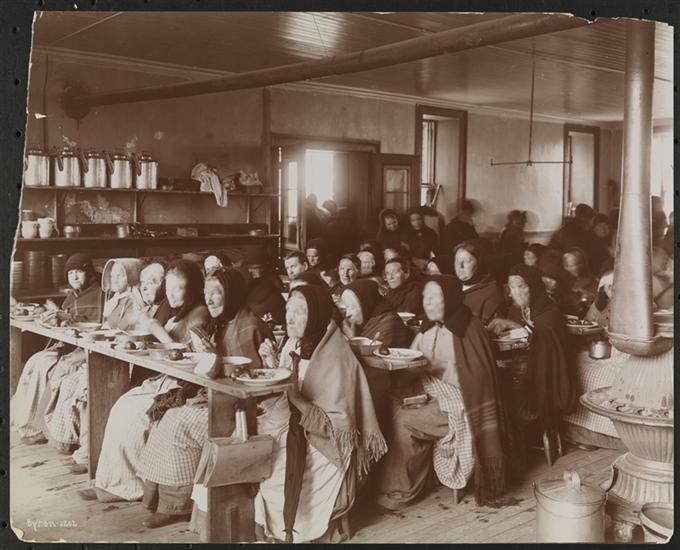 Through the years of the Almshouse and its related entities, Blackwell’s Island name also changed. It became Welfare Island in 1921, a name chosen to reflect the large number of institutions it held. 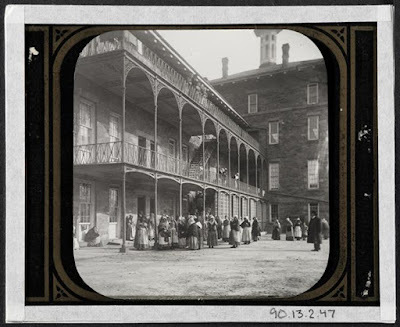 The Museum of the City of New York has a number of photographs of Blackwell's Island in its collection. They don't show the Hospital for Incurables, but they certainly summon the spirit of place.